Our restaurants allow us to take care of everything while you and your guests enjoy the most famous barbeque in the world. Our family style banquet menu provides you with three choices to make your event a success and we do all the work. Group family-style meals for 20 or more will be served in the public dining room. A private room is possible with certain time and minimum number requirements. For more information, or to reserve a family-style banquet call 816-231-1123 (Brooklyn Location) or 913-788-7500 (Legends at the Speedway Location). Beer, desserts, and specialty items are available upon request at an additional charge. A minimum headcount of 24 is needed to reserve a private room at Arthur Bryant's. All meats, rubs and select sides are gluten-free. 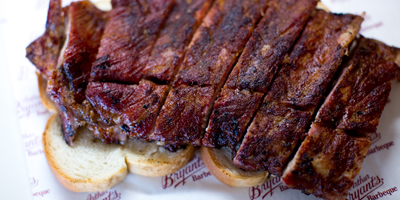 Allow Arthur Bryant's to take care of everything while you and your guests enjoy the most famous barbeque in the world. Our catering plans include delivery, set-up, food service, including serving equipment and utensils as well as disposable plates, plasticware, napkins, and service area clean-up. Drop-off program does not include food service and clean-up. For more information about our catering, drop-off and pick-up services, please call 913-788-7500. Drinks, desserts, and specialty items are available upon request at an additional charge. A minimum headcount of 40 is required for catering or drop-off orders. Pick-up plans are available for 30 or more. 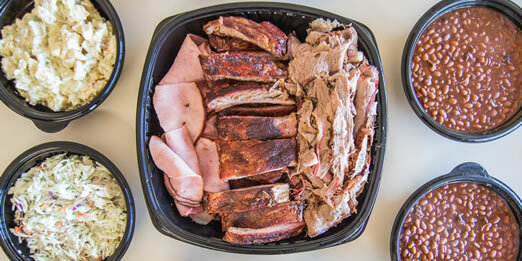 Pick-up party platters are available for 10-12, 30-36, and 50-60. Ask to see party pack brochure for details. Let us do all of the work! In order to assure your Party Pack is ready when you want to pick it up, call ahead 24 hours for smaller orders and 48 hours for larger orders. PICK-UP ONLY, please. 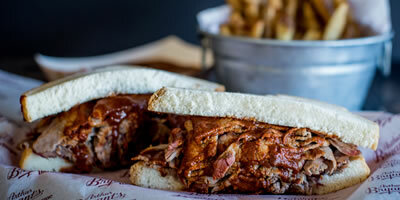 To order a Party Pack, please call 816-231-1123 (Brooklyn Location) or 913-788-7500 (Legends at the Speedway Location).